It has been a very busy week as term has started again at work so very late nights (tea at 10pm) and lots of running around. 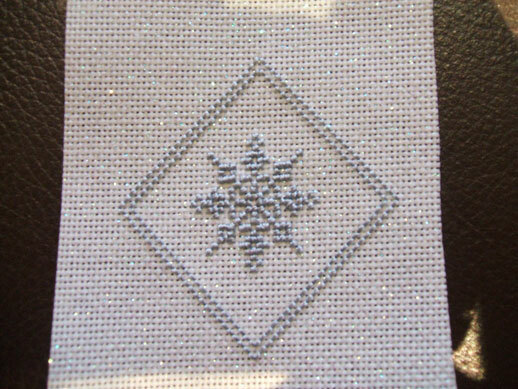 As I mentioned earlier I have been busy stitching snowflakes so here are some of the ones I have done already. They are not made up into ornaments yet but I am very pleased with them especially the very fine count ones on the white sparkly fabric. These are quite difficult to do especially as I left my bifocals on the plane on the way to Spain (oops!). I do have spare pair that are not bifocal but they make the telly very fuzzy. The joys of old age! 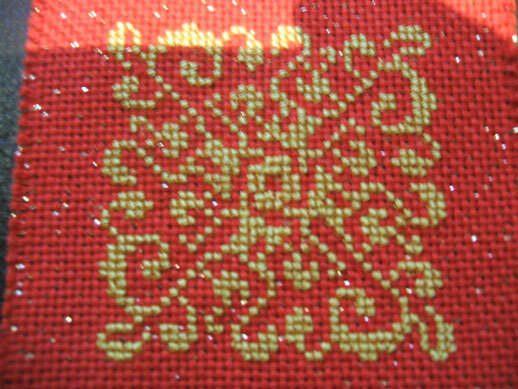 This one is a work in progress rather than a finish – again on the very tiny count fabric and is a motif from one of my newer Quaker Samplers. However I asked for a book for Xmas which my lovely sister bought me called Drunk, Divorced and Covered in Cat Hair. I found it on someone’s blog (forget who) but it is a fantastic tome – written by one of the funniest women I have ever read Crazy Aunt Purl. Buy her book – read her web and knit coz its fab. In order to do this I of course had to get some equipment and luckily lots of places were selling very, very cheap yarn (3 balls for £1) so I bought lots! 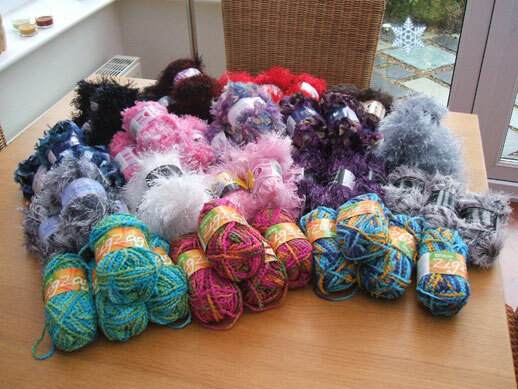 Below is my stash – I have added a few bits this week ! I now have enough to keep me busy for the rest of the year. While I will still stitch as well knitting is fab for when I am really tired after work and cannot see well enough for the little pieces and I have already finished my first scarf. 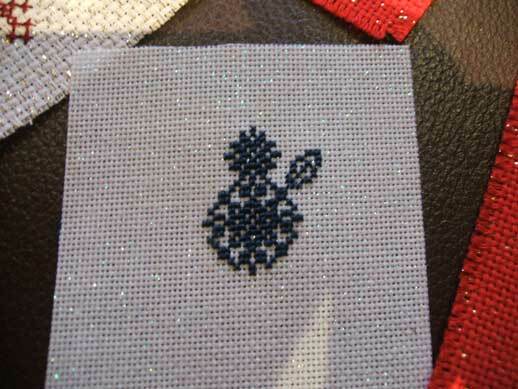 Here it is as a WIP (I will post a completed pic when Ellen has modelled it for me). 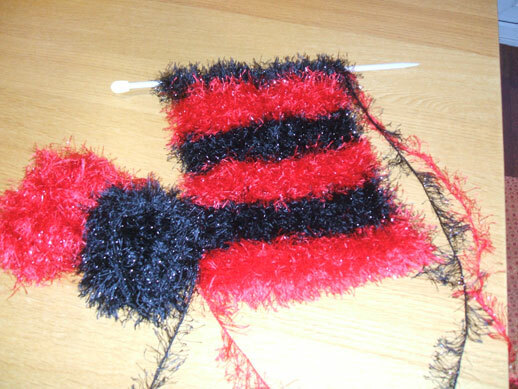 As you can see it is knitted from a fab eyelash yarn in just garter stitch which looks very good. I am already on with my second one and I am trying Aunt Purl’s special magic scarf checkerboard pattern for this one and a different yarn. I have of course been looking at lots of knitting web sites and have bought a couple of knitting mags and have found some fab things out there – isn’t the Internet wonderful! This is one of my fave sites so far, this woman is so talented (as an artist, photographer and knitter) and what she makes is so cute. Go and have a look at Julie’s blog Little Cotton Rabbits and I guarantee you will fall in love with them! I am not a very good knitter so I shall stick with scarves and maybe some hats and bags though I have downloaded the pattern and bought some wool to knit some jumpers for kids in Africa – see this Feed the Children link for details. Have also posted a Project Nepal update so go and look at that.